Dr. Robert M. Bauer joins White Eye Associates, PA, after serving as a comprehensive ophthalmologist in the United States Army. 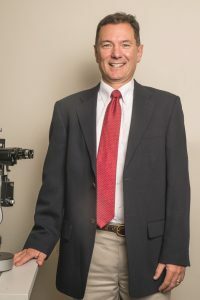 He was Chief of the Department of Surgery at Winn Army Community Hospital, Fort Stewart, Georgia, and also performed over a thousand laser refractive procedures for Special Forces Soldiers. Dr. Bauer received his medical degree from the University of Illinois, College of Medicine, and also earned a doctoral degree in neurophysiology from the University of Illinois. He completed his internship and a residency in ophthalmology at Walter Reed Army Medical Center. Dr. Bauer is certified by the American Board of Ophthalmology. He is also a faculty member of the East Carolina University Brody School of Medicine. His clinical interests include cataract and eyelid surgery.